For years, the term Wi-Fi has been used in conjunction with wireless internet whether it’s your private home network or free Wi-Fi hotspots which you can get access to almost anywhere be it cafes, streets, colleges, and so on. 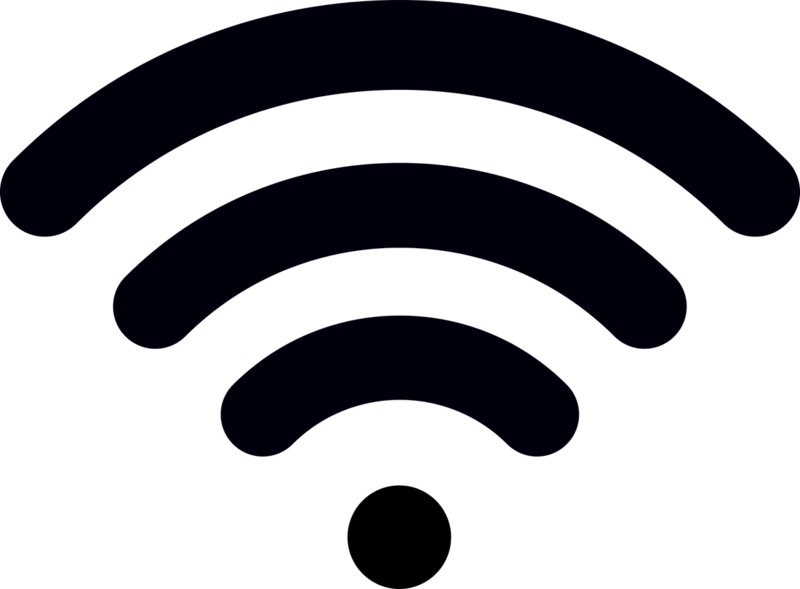 Wi-Fi is a networking technology that allows computer, laptops, smartphones, and other mobile devices to connect to the internet or communicate with each other wirelessly within specified range. Integrated Wi-Fi and cellular is seen as having the best of two worlds, capitalizing on the strengths offered by each technology. Owing to the widespread adoption of the wireless LAN systems at homes, offices, and other commercial spaces, cellular operators are not seeing WLAN as their competing technology, but something that complements them to increase the cellular system capacity. Both the technologies can be used to access internet, but they are very different from each other. Have you ever wanted to just sit and relax on a beach somewhere and surf the internet? Or connect to a wireless network in a café and check out your emails, or chat with your friend in a coffee shop? With Wi-Fi, you can do all these things and more. Put together some computers in your home and make them communicate with each other wirelessly – this can only be possible with a Wi-Fi. Wi-Fi is a technology that uses radio waves to provide internet access to mobile devices such as smartphones, laptops, tablets, etc and to facilitate intercommunication wirelessly. Cellular is a networking technology typically associated with a mobile telephone system that uses short-range radio stations to facilitate mobile device communication over areas comprised of cells and transceivers. The past few years have witnessed phenomenal growth in the wireless industry, both in terms of mobile technology and subscribers. 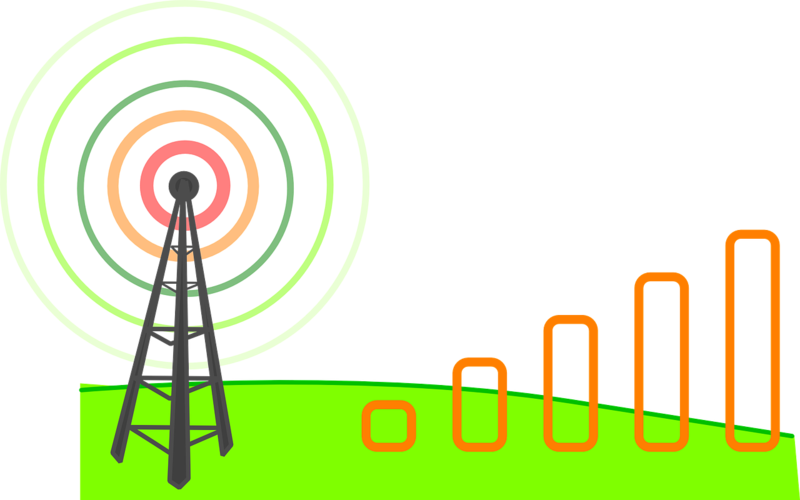 Cellular network refers to a mobile network and the idea is to provide high-capacity coverage over a wide area. When you’re not connected to a Wi-Fi network and still uses your phone to connect to internet, you’re using cellular data associated with your cell phone plan. Wi-Fi is primarily a local area networking technology that uses radio waves to provide high-speed internet access to mobile devices enabled with Wi-Fi. It not only allows mobile devices such as smartphones, laptops, and tablets to connect to the internet but also allows them to communicate with each other wirelessly. Cellular is a networking technology typically associated with a mobile telephone system that uses short-range radio stations to facilitate mobile device communication over areas comprised of cells and transceivers. Cellular means there is a cellular plan attached to the device which uses cellular signal to connect to the internet. Wi-Fi is a critical element and a crucial wireless networking technology based on the IEEE 802.11 standards. It is the Wi-Fi Alliance’s name for a wireless standard, or protocol, used for wireless communication. The Wi-Fi Alliance is a not-for-profit organization that certifies the interoperability of wireless devices to promote wireless technologies. It means any Wi-Fi enabled device can seamless communicate with another Wi-Fi enabled device wirelessly. Cellular refers to a mobile network which is distributed over a wide area commonly referred to as cells which are linked to one base station which in turn facilitates wireless connection via a mobile phone. Wi-Fi enabled means if there is a wireless signal, the device can use the Wi-Fi standard to broadcast and receive information. It means anyone can work almost anywhere by using a mobile Wi-Fi device to connect to the internet without wires on-the-go. Wi-Fi is the name given to the wireless devices that are certified to use the 802.11 standard for communication. The main objective of a cellular communication network is to provide high-capacity coverage over a wide area and to provide a cost-effective solution for the networks in terms of coverage, capacity and quality. Mobile technology is the technology used for cellular communication. A Wi-Fi device relies solely on Wi-Fi to connect to the internet and is generally much faster than a cellular network. Wi-Fi is perfect for data-intensive use such as online movies, YouTube, video conferencing, downloading music and videos, etc. Generally, Wi-Fi has no limit on how much data you can use in a day or a month. Cellular networks, on the other hand, use a proprietary frequency and a dedicated cellular operator and the services are chargeable based on weekly or monthly plans. Cellular data plans usually have daily or monthly cap on the data consumption limit. Wi-Fi is a disruptive technology that came unexpectedly but became a norm and has been growing at an unprecedented rate since then. Originally, Wi-Fi is just a hack so that people could connect their mobile devices, mostly notebook, to a network wirelessly that doesn’t have to be paid for. As Wi-Fi grows up, it is getting better and faster and more secure than ever. However, since Wi-Fi is a local area network, it can only operate within a specified range, unlike cellular networks, which operate outside boundaries. Cellular network cover a wide area spanning towns and cities and even countries. You can access internet using both Wi-Fi and cellular data, but cellular can be way more expensive than Wi-Fi. Sagar Khillar. "Difference Between Wi-Fi and Cellular." DifferenceBetween.net. 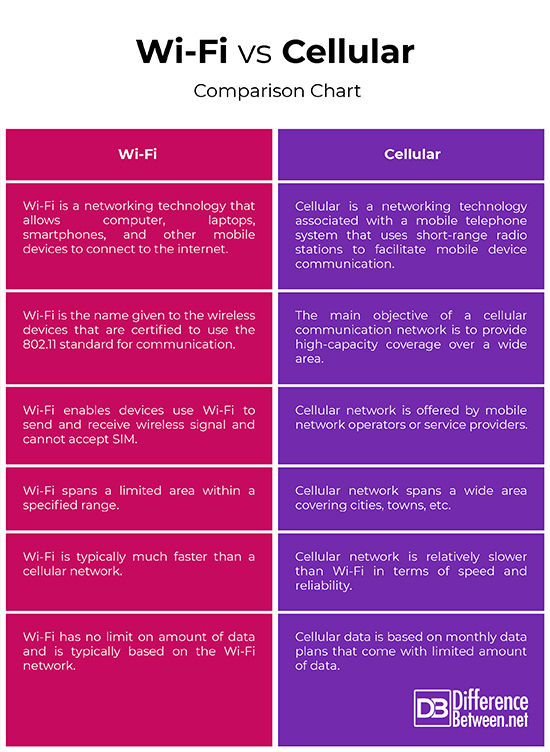 November 16, 2018 < http://www.differencebetween.net/technology/internet/difference-between-wi-fi-and-cellular/ >.